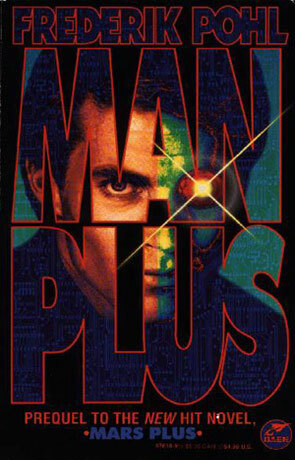 Man Plus is a classic science fiction novel by Frederik Pohl. In the near future things will start to go bad. Really bad - international tension will rise, numerous smaller and not so small wars will flare. Resources will be scarce. Chaos will rule around the globe - even in the good old U.S. of A. The evil Asians (controlled by the even more evil Chinese) are looking for an excuse for launching A-bombs to the left and right. I not sure what is happening in Europe, but I think that it's in total chaos and ruled by (evil) dictators Africa? What's that? As I was saying, things are going bad - but luckily the clever Americans have found the thing that can reunite the world: Putting a man on Mars and having him stay and survive! But this means that some pure sucker will have to be reengineered, in to a cyborg that has little resemblance to ordinary humans, except of course the thing that make him a human - his brain. This is the job for the Man Plus Project. Roger Torroway is the third backup volunteer for this transformation, but when the first "Man Plus" dies (or should I say malfunctions) and the second backup breaks his leg, Torroway suddenly finds himself the only volunteer. Talk about waking up to reality. Man Plus is a very interesting novel - as Torroway is transformed from a human to a Martian, Pohl not only gets to explore the subject of what it is to be human, he also gets to explore a lot of ideas as to what it would take to survive on Mars. Oh, yes, do yourself a favor and DO NOT read the garbage on the back of the book - it kind of ruins the twist the story takes at the end. Written on 1st January 1999 by TC.